Casino Stugan will then reward you with a bonus (Welcome Bonus is for new players only). The terms and conditions of the bonuses vary between different casinos and might also change over time and between different countries, so it is important to compare the different offers and read the T&C for Casino Stugan before signing up. 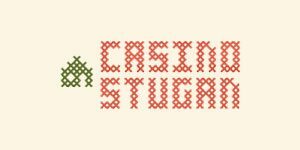 The name “Casino Stugan” is a swedish name and translates in to Casino Cabin. 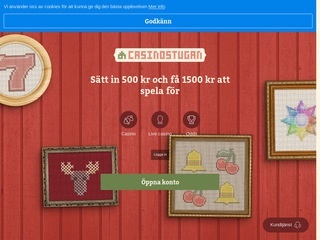 This nordic casino opened it’s doors in 2015 for the Swedish market currently the site only has one language Swedish. Casino Stugan is the sister casino to Mobilbet that has a runs a global model with multiple languages. The casino is running on a highly customized playtech platform that is a delight to players with easy navigation and a really stylish site. The casino works well on any device such as mobile tablets and computer. The game department on the site is quite extensive with partners such as, MicroGaming, NetEnt, WMS, Play´n Go, Betsoft, Evolution Gaming, Nolimit, NYX, Playtech, Skillzgaming, Yggdrasil and Thunderkick. With a bewildering amount of over 850+ games in their library you are sure to find some of you’re favorite titles among them, with classical games from NetEnt such as Starburst, Gonzo’s Quest and Jack and the Beanstalk to more recent titles from new Up-and-coming developer Yggdrasil that provides the casino with games such as Viking Go Berzerk, Golden Fishtank and Lucha Maniacs. Or maybe try out some of time super popular main-stream slots from Play’n go with titles such as Book Of Dead, Moon Princess and Reactoonz. The casino easily allows you to sort games with 24 different categories ranging from, New games, Big Win, Table Games or sort by developer and many more. The table game section is currently quite small with only 8 games at writing time. Players can choose among classics such as Texas Hold´em, Pontoon, Baccarat and a few other titles. The casino also offers a small library of different alternative games such as bingo, scratch cards and video-poker try you’re luck in titles such as Scratch Ahoy!, Sassy Bingo or classic video poker. The live casino section on the site is powered by Evolution Gaming, known widely for their high quality live Igaming. Players get to choose between 6 live table games, play classical table games such as Blackjack, Live Hold’em or live three card poker and Roulette. Casino Stugan provides players with a good selection of different banking methods for withdrawals and deposits, Diners Club International, Maestro, Entropay, FundSend, Fast Bank Transfer, Paysafe Cards, POLi, Siru Mobile, Trustly, Ukash, Visa, Visa Debit, Visa Electron and WebMoney. Deposits are processed instantly. Withdrawals usually takes 2 days with e-wallets while bank and debit card transfers can range between 2-7 days. Maximum withdrawal is 10 000€ per withdrawal we could not find any limits on how much you can withdraw weekly / monthly. Casino stugan features a dedicated support team that can be reached normal business hours (CEST) Between 10:00 23:00. For less urgent questions the support-team can also be reached trough mail. The casino features a huge FAQ section that answers most questions casino players tend to have.